It’s been a busy Winter for Sonic the Hedgehog, the first episode for Sonic 4 was finally released at the beginning of the season, and Sonic Colours debuted as exclusives for Nintendo’s Wii and DS. The former title did reasonably well in reviews, maintaining a nostalgic feel to the original games while adding its own personal feel. But how does the newest entry in the main console series fare? 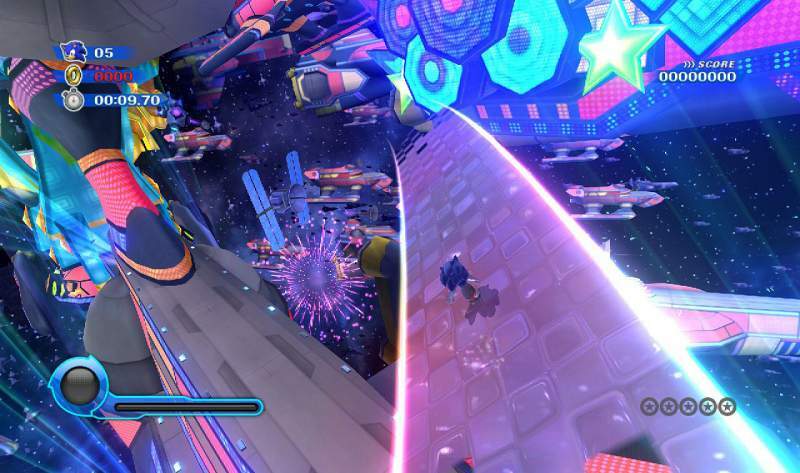 Sonic Colours takes place in outer-space, Dr Eggman has managed to capture whole planets and enslave the alien beings (called “wisps”) to power his “Intergalactic Amusement Park”. Sonic and Tails however have caught wind of his schemes and check the park out, It turns out the captive wisps can grant powers to Sonic, allowing him to do various things like speed boost, drilling and transforming into a sharp-shooting laser. With the aliens on side, Sonic starts his latest adventure. Like the last major console title, Sonic Unleashed, this is a solo ‘hog adventure. But this time it’s all the usual Sonic action, as opposed to splits between with “Werehog” sections. Sonic does transform with the aid of the wisps, but these powers are temporary and match Sonic’s general pace (with a little slowdown so the powers are controllable). 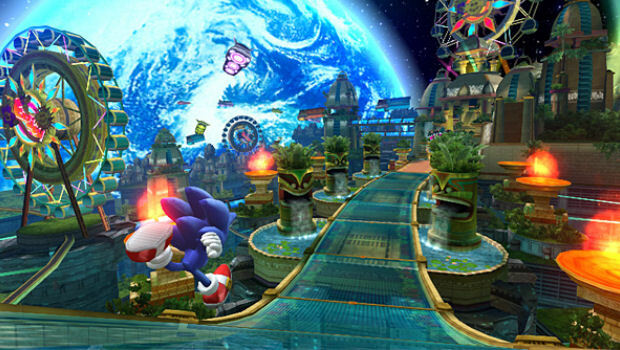 In addition the white Wisps provide Sonic with a speed boost gage that gives Sonic additional blistering speed (which can be used to speed up runs and get a higher trajectory on ramp jumps). Levels are split between 6 planets, with 6 acts in each area and a boss. Eggman has to be applauded on making a pretty exciting park, there’s plenty of speed runs, platforming, and puzzles to solve during the course of the game. Some of these can be solved by Sonic doing the usual running and jumping, but lots of goodies, including the 5 red rings hidden in each level, are found with use of the Wisps and additional platforming skill. The game frequently rewards curious players for exploration, opening up shortcuts and goodies for those that take a chance on a less obvious route. These also provide good opportunities for getting to grips with wisp power-ups, at least one new Wisp is introduced per world and then available in earlier levels, opening up new areas. The score system has been revamped too, various bonus multipliers are given for special skills and good use of wisp powers alongside the usual ring collecting and dashing to the goal. As a result, players have to pretty savvy in order to get that elusive “S Rank” for every level. 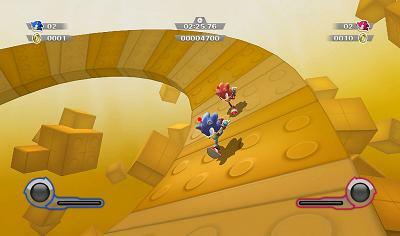 Each level has a particular theme, from roller coasters right down to sweets & doughnuts. The touches added to these levels add additional charm. Sweet Mountain has doughnut rings to dash though and popping corn that pops in Sonic’s wake, while Starlight Carnival has stunning chase sequences that have a strong resemblance to “Rainbow Road” from the Mario Kart series. The music in-game is well done too, each planet having a different theme that’s remixed over the 6 acts. The Sonic Simulator levels have delightful 8-Bit renditions of each Zone theme that stand out in their own right too. In addition to this, Eggman uses a park-wide tannoy to make announcements which add atmosphere and when heard properly are actually quite funny. The new voice cast is well directed and add a touch of professionalism that’s been lacking from the series. The script is quite a gem too, though cutscenes are sparse anyway. The only real issue with Sonic Colours is that the game is kind of short; it’ll only take about 5-6 hours solid play to finish the main game. But there are 5 red rings per level to collect that require some exploration and use of wisp powers to locate. The last few levels (particularly Asteroid Coaster) let down the game with some slightly unfair gravity puzzles but otherwise this particular title lets it’s colours shine magnificently and gives the blue hedgehog a true triumphant return at last. Previous Previous post: Robert Llewellyn reviews Parrot’s AR Drone!